There are 3 versions of this aircraft. 1 A None No Power Seat 1 A is a Comfort Class Bulkhead seat, however, the close proximity to the lavatory and galley may be bothersome. The tray table is in the armrest, making the armrests immovable and slightly reducing seat width. There is no floor storage for this seat during takeoff and landing. 1 C None No Power Seat 1 C is a Comfort Class Bulkhead seat, however, the close proximity to the lavatory and galley may be bothersome. The tray table is in the armrest, making the armrests immovable and slightly reducing seat width. There is no floor storage for this seat during takeoff and landing. 1 D None No Power Seat 1 D is a Comfort Class Bulkhead seat, however, the close proximity to the lavatory and galley may be bothersome. The tray table is in the armrest, making the armrests immovable and slightly reducing seat width. There is no floor storage for this seat during takeoff and landing. 1 F None No Power Seat 1 F is a Comfort Class Bulkhead seat, however, the close proximity to the lavatory and galley may be bothersome. The tray table is in the armrest, making the armrests immovable and slightly reducing seat width. There is no floor storage for this seat during takeoff and landing. 16 B None No Power Seat 16 B is an Economy Class seat with extra storage space, however, there may be limited recline due to the Exit Row behind. 16 C None No Power Seat 16 C is an Economy Class seat that may have limited recline due to the Exit Row behind. 16 D None No Power Seat 16 D is an Economy Class seat that may have limited recline due to the Exit Row behind. 16 E None No Power Seat 16 E is an Economy Class seat with extra storage space, however, there may be limited recline due to the Exit Row behind. 17 A None No Power Seat 17 A is an Economy Class Exit Row seat that has extra legroom, and there is also no seat in the row ahead. There may be limited recline. The tray table is in the armrest, making the armrests immovable and slightly reducing seat width. There is no floor storage for this seat during takeoff and landing. 17 B None No Power Seat 17 B is an Economy Class Exit Row seat that has extra legroom. However, there may be limited recline. The tray table is in the armrest, making the armrests immovable and slightly reducing seat width. There is no floor storage for this seat during takeoff and landing. 17 C None No Power Seat 17 C is an Economy Class Exit Row seat that has extra legroom. However, there may be limited recline. The tray table is in the armrest, making the armrests immovable and slightly reducing seat width. There is no floor storage for this seat during takeoff and landing. 17 D None No Power Seat 17 D is an Economy Class Exit Row seat that has extra legroom. However, there may be limited recline. The tray table is in the armrest, making the armrests immovable and slightly reducing seat width. There is no floor storage for this seat during takeoff and landing. 17 E None No Power Seat 17 E is an Economy Class Exit Row seat that has extra legroom. However, there may be limited recline. The tray table is in the armrest, making the armrests immovable and slightly reducing seat width. There is no floor storage for this seat during takeoff and landing. 17 F None No Power Seat 17 F is an Economy Class Exit Row seat that has extra legroom, and there is also no seat in the row ahead. There may be limited recline. The tray table is in the armrest, making the armrests immovable and slightly reducing seat width. There is no floor storage for this seat during takeoff and landing. 2 A None No Power Seat 2 A is a standard Comfort Class seat. 2 C None No Power Seat 2 C is a standard Comfort Class seat. 2 D None No Power Seat 2 D is a standard Comfort Class seat. 2 F None No Power Seat 2 F is a standard Comfort Class seat. 3 A None No Power Seat 3 A is a standard Comfort Class seat. 3 C None No Power Seat 3 C is a standard Comfort Class seat. 3 D None No Power Seat 3 D is a standard Comfort Class seat. 3 F None No Power Seat 3 F is a standard Comfort Class seat. 30 C None No Power Seat 30 C is a standard Economy Class seat, however, the close proximity to the lavatories may be bothersome. 30 D None No Power Seat 30 D is a standard Economy Class seat, however, the close proximity to the lavatories may be bothersome. 31 A None No Power Seat 31 A is an Economy Class seat in the last row of the plane and may have limited recline. The close proximity to the lavatories may be bothersome. 31 B None No Power Seat 31 B is an Economy Class seat in the last row of the plane and may have limited recline. The close proximity to the lavatories may be bothersome. 31 C None No Power Seat 31 C is an Economy Class seat in the last row of the plane and may have limited recline. The close proximity to the lavatories may be bothersome. 31 D None No Power Seat 31 D is an Economy Class seat in the last row of the plane and may have limited recline. The close proximity to the lavatories may be bothersome. 31 E None No Power Seat 31 E is an Economy Class seat in the last row of the plane and may have limited recline. The close proximity to the lavatories may be bothersome. 31 F None No Power Seat 31 F is an Economy Class seat in the last row of the plane and may have limited recline. The close proximity to the lavatories may be bothersome. 4 A None No Power Seat 4 A is a standard Comfort Class seat. 4 C None No Power Seat 4 C is a standard Comfort Class seat. 4 D None No Power Seat 4 D is a standard Comfort Class seat. 4 F None No Power Seat 4 F is a standard Comfort Class seat. 5 A None No Power Seat 5 A is an Economy Class Bulkhead seat. The tray table is in the armrest, making the armrests immovable and slightly reducing seat width. There is no floor storage for this seat during takeoff and landing. 5 B None No Power Seat 5 B is an Economy Class Bulkhead seat. The tray table is in the armrest, making the armrests immovable and slightly reducing seat width. There is no floor storage for this seat during takeoff and landing. 5 C None No Power Seat 5 C is an Economy Class Bulkhead seat. The tray table is in the armrest, making the armrests immovable and slightly reducing seat width. There is no floor storage for this seat during takeoff and landing. 5 D None No Power Seat 5 D is an Economy Class Bulkhead seat. The tray table is in the armrest, making the armrests immovable and slightly reducing seat width. There is no floor storage for this seat during takeoff and landing. 5 E None No Power Seat 5 E is an Economy Class Bulkhead seat. The tray table is in the armrest, making the armrests immovable and slightly reducing seat width. There is no floor storage for this seat during takeoff and landing. 5 F None No Power Seat 5 F is an Economy Class Bulkhead seat. The tray table is in the armrest, making the armrests immovable and slightly reducing seat width. There is no floor storage for this seat during takeoff and landing. Audio is available through GOL's entertainment portal, GOL ON AIR, at no additional cost. In-flight entertainment is available through GOL's entertainment portal, GOL ON AIR, at no additional cost. GOL ON AIR may be accessed by laptops with WiFi, tablets (iPads, Galaxy Tab, Motorola Xoom, Blackberry Playbook), iPhones and smartphones running Android 2.2 or higher with flash 10.1 or higher. Other smartphone models with WiFi may connect but experience distortions and limitations depending on their operating system and software versions. All food and beverage items are available for purchase onboard GOL. Payment can be made using a credit card or domestic currency. This version of 737-800 operates in a two-class configuration with 16 Comfort Class seats and 154 Economy Class seats. There are two other versions of GOL 737-800s: a one-class configuration of 178 seats and a one-class configuration of 183 seats. This configuration is only available for international flights, with the destination of origin from Rio de Janeiro-Galeao (GIG) or Sao Paulo-Guarulhos (GRU). 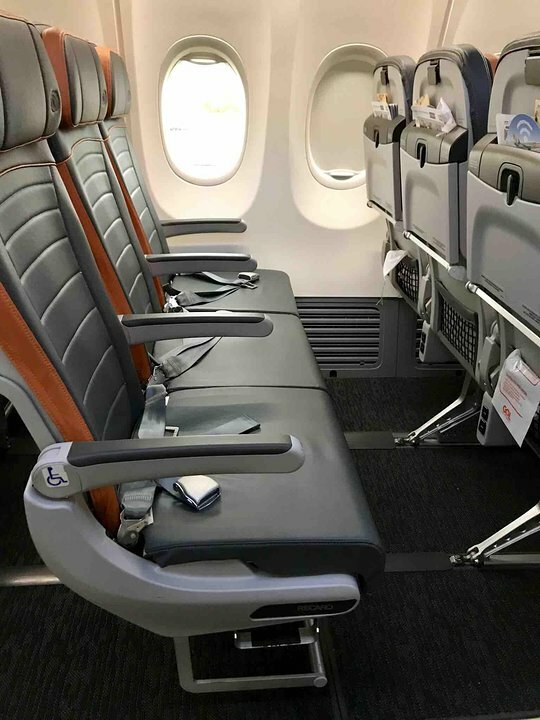 You show two seats but this is a row of three economy seats. For international, they block the middle seat. For domestic, they sell all three seats. Gol flies 3 versions of Boeing 737-800 (738) V1.